In 2016 we asked ourselves what role, if any, a city like ours could play in making a positive difference to food resilience and sustainability for others as well as ourselves, given the parlous state of the world’s resources. (for more about this, see our horizon scanning report: Back from the Future (2018). 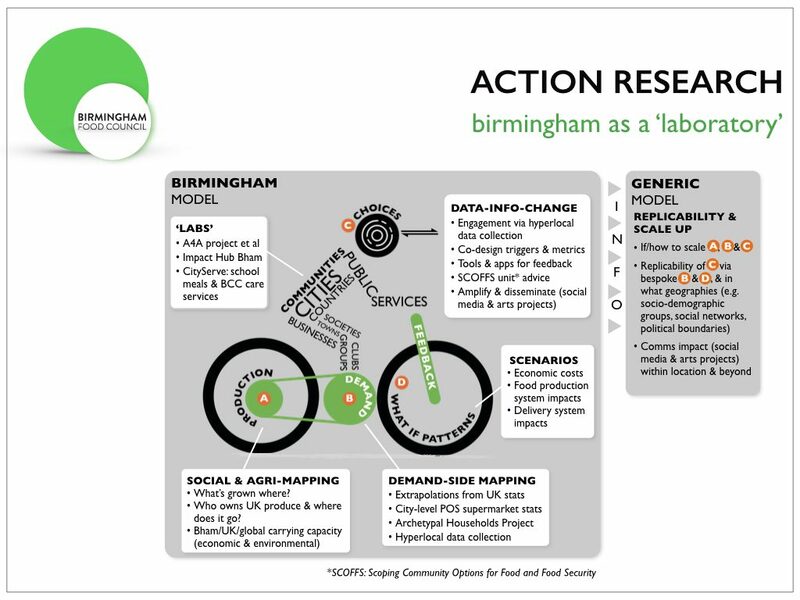 In order to answer that question, we’ve spent the last couple of years devising an Action Research programme in which Birmingham is a ‘laboratory’ for a series of experiments, and discussing its feasibility with experts from diverse fields. This programme is part evidence-based, and part (what we call) ‘Narrativium‘ based; i.e. using the arts as a means to amplify and disseminate the research. And, as the bike infographic implies, we’ve negotiated several ‘labs’ within the city, representing both demographic and geographic communities. We’ve started to analyse data through our Archetypal Household project. We’ve also set up a small group of experts in what we’re calling the SCOFFS unit to advise us on tools, apps and context. Can changes in our demand make a difference? We can’t increase food supplies within the city; over 99.99% of all we eat and drink is grown outside the city boundaries. 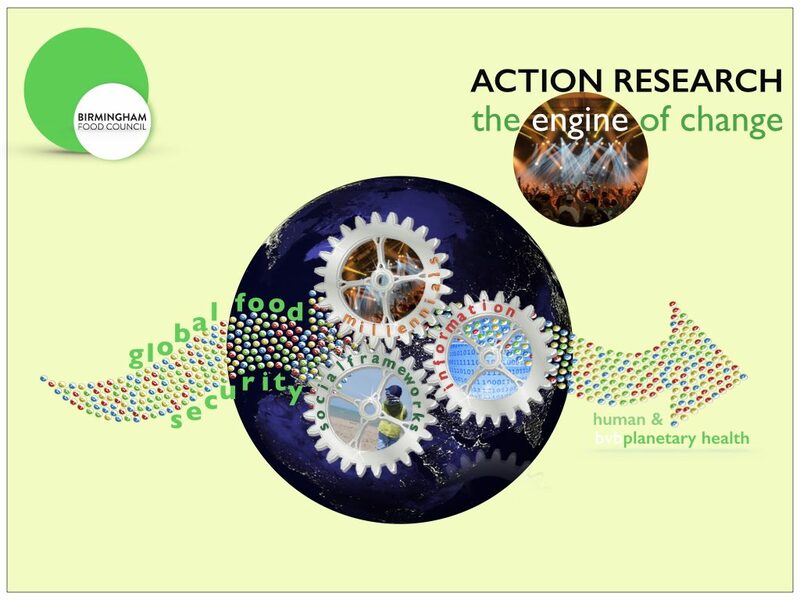 In this blogpost in October 2016, I quoted Tim Benton: We recognise that demand for food is driving emissions and work to change that to meet the supply-side improvements halfway.” Could we here in this city change our our diets, change our food demand and be a measurable element of meeting the ‘supply-side improvements halfway’? Will people be motivated to change their diet in order to change the agricultural landscape? Conversations with various communities around the city have told us many are highly motivated to contribute to Birmingham making a positive difference to to global food resilience and sustainability. There’s also interesting evidence from the US Department of Agriculture Economics Group to suggest the Millennial generation are making qualitatively different food and beverage choices than previous ones and that they’re motivated by food security issues. How can we measure change and its impact? This city, as others, has a global footprint. As elsewhere, too, citizens consume food and drink with zero or low nutritional vale. Few, however, recognise that consumption of these products impacts global food resilience, security and sustainability. Will changing diets have economic impact locally? What level of reliability can we put on production ‘back wheel’ info? First, the data sources are dispersed across the food network and some are not in the public domain (e.g. much of the logistics info, and who owns what at the field-level in the UK). Secondly, the academics rightly hedge about information quality into the ‘what-if’ patterns, and we’re beginning to think about how machine learning could play a part in meeting this challenge.